It's impressive how Netflix managed to change the story on The Cloverfield Paradox. Initially titled God Particle, the third movie in the Cloverfield universe has had a troubled path to the world. It was first slated for release by Paramount on October 27th of last year. Then, with little fanfare, It was pushed to February. Then April. Then Paramount didn't seem interested in releasing it at all, really. Enter the big red N, who in not having to worry about silly things like box office numbers saw an opportunity. They swooped in for the distribution rights and suddenly had a fully completed film set in an established science fiction universe of some acclaim (neither Cloverfield nor 10 Cloverfield Lane were giant hits, but they’re quite beloved) with an impressive cast that no one had even seen a hint of a trailer from. So why not drop its first ever trailer during one of the most exciting Super Bowls in history and then casually mention you’re releasing it right when the game ends? It’s a hell of a way to get attention, the sort of gambit Netflix is more than capable of pulling off. And social media seemed to indicate almost as many people firing up their streaming boxes to check out The Cloverfield Paradox as kept their TV on NBC for the post Super Bowl THIS IS US. The question, though, is what would be awaiting them when they watched it. Is this a case of Netflix plucking a diamond in the rough from the shelf or Paramount letting it slide for a reason? Unfortunately, it becomes pretty clear pretty quickly that Paramount knew what they had on their hands. 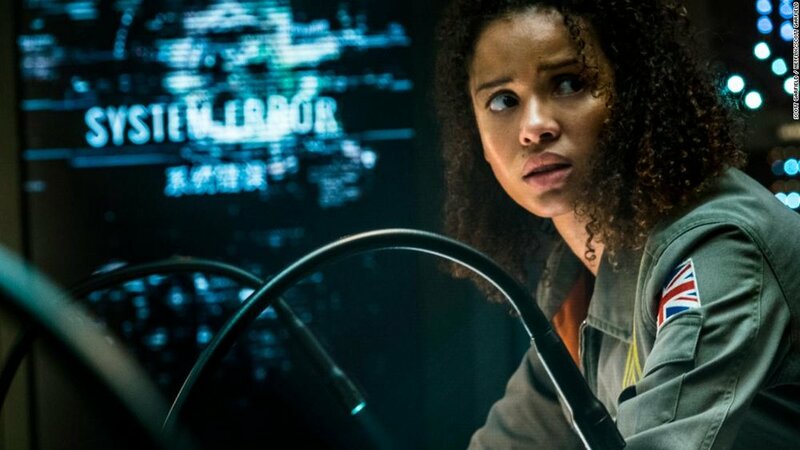 On its surface, The Cloverfield Paradox is very much in the mold of 10 Cloverfield Lane. This was a film originally conceived as a script that had nothing to do with the “Cloverfield Universe,” scooped up by J.J. Abrams’ Bad Robot production company and altered to take place in this nebulous franchise. Set in the near future, the film describes a world on the brink of an energy crisis likely to bring about global war if not for a last ditch effort from a group of scientists who take to space to use a particle accelerator to do...something that will result in a renewable energy source that will save the world from destruction. Our eyes into the story are Ana Hamilton (Gugu Mbatha-Raw), the wife of Michael (Roger Davies), who leaves him behind to take to the skies. On the space station, she works with commander Kiel (David Oyelowo) and a group of outsizes personalities (Daniel Bruhl, John Ortiz, Chris O’Dowd, Aksel Hennie and Ziyi Zhang) who can’t seem to leave their nationalistic tendencies on the ground. After a few less than successful attempts to activate the particle accelerator, the crew finally seem to get it up and running only for an overload to cause an explosion. But that’s not the only problem, as the space station, once orbiting Earth, now appears to be in open space with the planet nowhere to be found. And a new crew member (Elizabeth Debicki) has appeared out of nowhere. Strange things are clearly afoot. Those looking for some hard science fiction, something akin to Interstellar or the first two thirds of Sunshine need not apply to The Cloverfield Paradox. This film is far more interested in just being weird for weird’s sake, clearly taking inspiration from schlocky space horror like Event Horizon. The script, from Oren Uziel, isn’t remotely interested in establishing rules or expectations to how things get weird on the ship, content to simply throw some set pieces on the table and explain it all away with vague allusions to quantum entanglement and parallel universes and other nonsense. That’s not to say an approach like this can’t be successful, but the proof lies in the pudding and execution is what matters. And the execution here simply isn’t up to snuff. To be fair, one of the ideas does reap benefits. One moment in particular, involving discovering something rather gruesome inside a wall, is the sort of shock tactic that works, but that’s pretty much the only example. Everything else is a hodgepodge of random moments that don’t link together, including a completely useless B plot back on Earth involving a small child that goes nowhere. What’s worse are the technical problems that seem to make it clear the film was in a barely releasable state when Netflix bought it from Paramount. The sound design and mixing is especially poor, with constant barely audible mumbled dialogue that should have been fixed in post production and all sorts of shoddy, rushed cuts from its three credited editors. The acting seems noticeably lower quality considering the cast assembled, with no one looking particularly interested in giving it their all. Director Julius Onah has even managed to make Elizabeth Debicki uninteresting, an act that was presumed impossible and shouldn’t be allowed by the laws of man. The result is a lazy, uninspired waste of a movie shoehorned into a poorly defined universe thanks to a hasty scene tacked onto the end. The ending of 10 Cloverfield Lane felt almost as superfluous (it was one of my main problems with that film), but the rest of it was so good that it didn’t really matter in the end. I was worried about the whole concept after that movie came out, wondering if it could be sustainable to take these movies and shove some monsters into them and call them Cloverfield to goose the marketing, and The Cloverfield Paradox makes it pretty clear that the Cloverfield name isn’t worth anything if the movie that bears it isn’t any good. It’s just a cash grab, a way to take a mess of a film and give it some undeserved cache. Bad Robot needs to be careful with the projects they choose to Cloverfield-ify in the future, as a few more The Cloverfield Paradoxes will end up spoiling the pot for a long time to come. Paramount clearly knew that this movie needed work, and seemed reticent to put in the work it needed. Netflix doesn’t have to worry about that, so they can feel emboldened to take what feels like a direct to DVD sequel or SyFy original movie, spend a ton of money on two Super Bowl trailer spots and become the talk of the pop culture landscape. That is, until people watch it and realize how much of a giant waste of time it is.